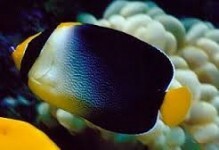 The Golden Angel, also known as the Aurinatus Angelfish or Velvet Dwarf Angel. This hard to find species is cryptic in nature, making them both difficult to acquire and a prized fish in the hobby. 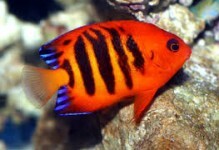 This species is identified by its velvet looking burnt orange/red coloration with thin, broken yellow vertical bars running along each side of the body. 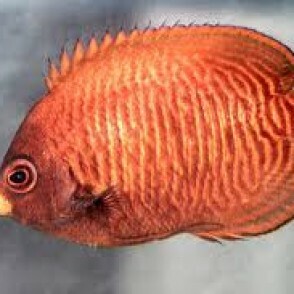 The Golden Angel requires a minimum tank size of 55 gallons with plenty of hiding places and live rock for grazing. 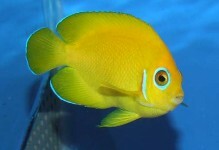 This angelfish is best kept as the only dwarf angel in a tank. 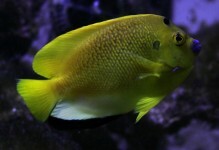 It will adjust rapidly if it is introduced as one of the first fish in a well-established aquarium, or if it is introduced and maintained with very peaceful tankmates. Often maintained by hobbyists in the reef aquarium, caution should be used if there is an abundance of LPS and SPS coral in the tank. This species has been known to nip at these corals as well as Xenia corals. In most cases the fish will not damage these corals, but rather just irritate them. The Golden Angel, like other dwarf angels, are hermaphroditic, difficult to breed, and indistinguishable in color variations from male to female. 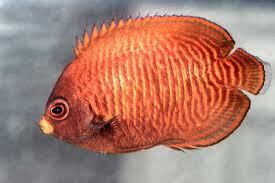 The Golden Angel prefers a variety of small meaty items, angelfish and herbivore preparations, and live sponges.